Demonetization Was India’s Biggest Moment On Twitter in 2016; PM Modi Becomes Most Followed Indian! Twitter, world’s most powerful micro-blogging tool reflects a lot more than mere tweets and hashtags – it reflects the nation’s mood and its temperament. When more than 4 crore Twitter users send in their emotions, love, fear and anger, then there was lots of interesting derivations and outcomes. 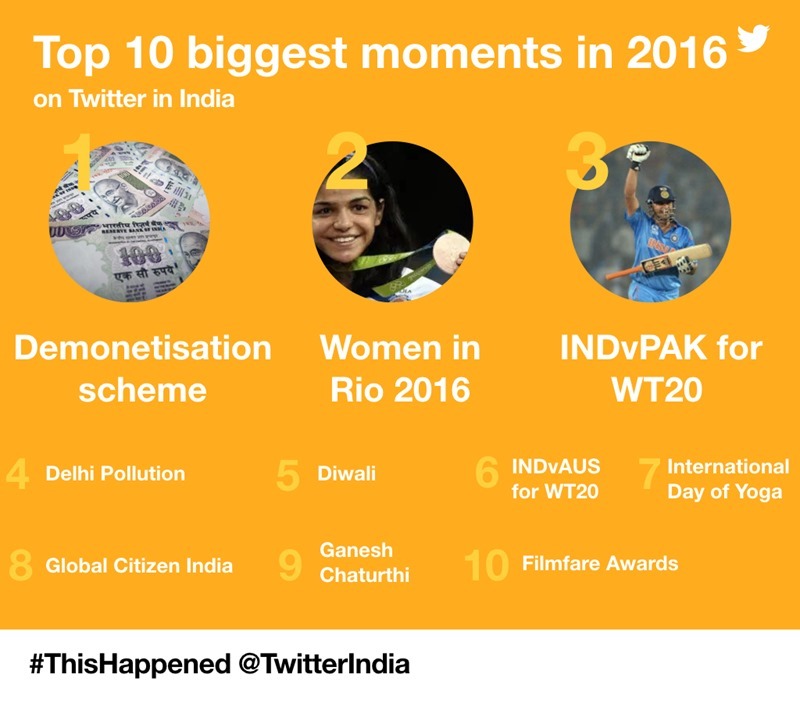 Twitter India has released their annual YearOnTwitter report for 2016, and there are lots of surprises for India here. With 25.3 million followers, PM Modi has become India’s most followed celebrity on Twitter, as he finally beat Amitabh Bachchan who has 23.8 million followers as of now. For the last 3 years, Amitabh Bachchan reigned the charts as the most followed Indian on Twitter, but now, his spell has been finally broken as PM Modi added 8.8 million followers in 2016. 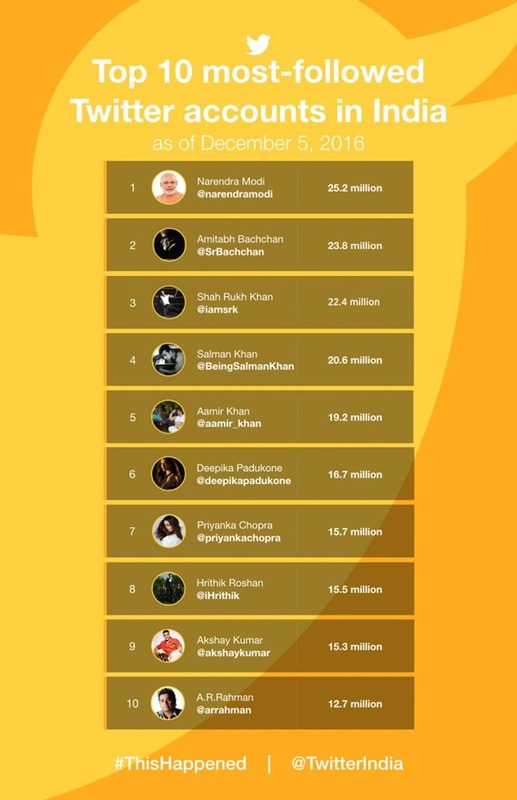 Interestingly, after PM Modi on #1 position, the rest of the top 10 slots are occupied with Bollywood stars, as entertainment remains #1 audience niche on Twitter. After Amitabh Bachchan on #2, Shahrukh Khan is at #3, Salman Khan is at #4, Aamir Khan is at #5, Deepika Padukone is at #6. In a major surprise, Priyanka Chopra has climbed to #7 spot, beating Hritik Roshan, who has now slipped to #8. Akshay Kumar is at #9 and AR Rehman is at #10. On the night of November 8th, when PM Modi announced the brave and bold decision to ban Rs 500 and Rs 1000 currency notes, excited Twitter users from India tweeted 6.5 lakh tweets within next 24 hours, and millions more in the subsequent days. This made demonetisation as the biggest moment on Twitter India for 2016. The superb performance of women athletes in Rio Olympics was second biggest event which triggered Twitter users, followed by India Vs Pakistan World T20 match, Delhi pollution and International Yoga Day. Among hashtags, sports events dominated the charts, as sports fans continued to send millions of tweets, sharing news about their favourite sporting events. 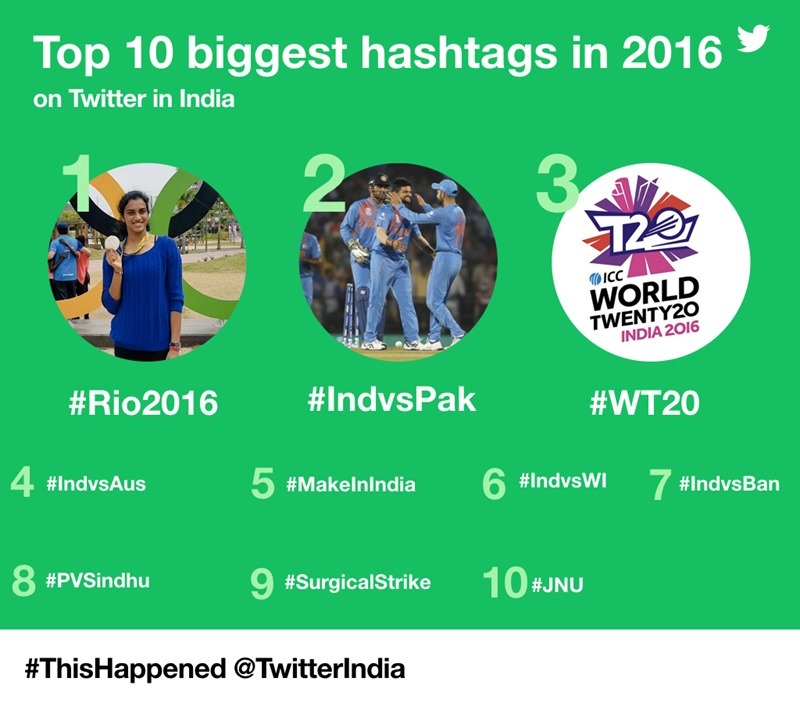 In this category, #Rio2016 was declared as #1 hashtag on Twitter India, followed by #IndVsPak and #WT20. PV Sindhu, who made India proud at Rio Olympics was at #8 (#PVSindhu), while Indian army’s surgical strikes against Pakistan after Uri terrorist attack was at #9. Golden Tweet of the Year is the tweet which received maximum retweets, and this year, it was Virat Kohli, whose tweet supporting his friend Anushka Sharma became the most retweeted tweet of the year. He had posted a tweet attacking the trolls who were targeting Anushka Sharma for their breakup. Via his Tweet, Virat slammed these trolls, and thereby, became an even larger celebrity. This Golden Tweet was retweeted record 40,000 times and liked 107,000 times. "Demonetization Was India’s Biggest Moment On Twitter in 2016; PM Modi Becomes Most Followed Indian! ", 2 out of 5 based on 3 ratings.